Have you ever envied those people who live a YOLO lifestyle? If you don't know what is YOLO, it means "You Only Life Once". This is a mindset that since we really only live once, why not just enjoy life first? Why think and plan for the future? When I was younger in secondary school, I had a classmate who came from a rich family. The parents gave him $50 a day. At that time, my allowance was only $20 a week which was just sufficient for my meals in school. Each meal cost about $2 then. With $50, this classmate could buy lots of stuff he wants. He was the envy of many other classmates and friends surrounded him to get some benefits from him. Sadly, later on he got suspended from school and in the end got expelled because of some police case. Later I found out he was caught stealing from a book store in a shopping mall. It was an irony that he has the most money but still steals from a book store. Money can cause a lot of problems. Just last week, MAS and CAD raided a few trading firms such as DBS vickers, Maybank Kim Eng, Phillip securities and OCBC secutiries. Some remisers were taken away for questioning. The MAS confirmed on Friday that together with the CAD, it is investigating possible contraventions of the Securities and Futures Act. Money can cause people to do things that breaks the law. I'm sure all of us have friends who live from pay check to pay check. They empty their bank accounts and enjoy life to the fullest. They travel around the world, enjoy the finest food, enjoy luxuries and live for the moment without thinking about the future. This is even better than my classmate who has $50 to spend everyday. It is possible to spend hundreds of dollars per day. I am not against enjoying life. In fact, I've ditched my budget and spend as much as I can currently. I wrote a post on this previously here. The frugal lifestyle on the other hand is a life of prudence. This person spends wisely and thinks for the future. He tries to save as much as he can because he thinks he will need the money in the future. There are also extreme frugality cases where a person saves and saves and forgets what enjoying life is all about. Both the YOLO and frugal lifestyle becomes a habit. Both can be bad or good. There is a fine line between frugality and cheap. Our lifestyle ultimately affects the people around us. A person with a YOLO lifestyle may have spent all his money and can't even pay the bills on time for his family. Or he may have got into too much debt and made the family suffer. On the other hand, a frugal person can also affect the people around him negatively. He may have saved too much and compromises on quality. The family doesn't get much enjoyment in life and live on a tight budget. How To Balance Frugality and the YOLO Lifestyle? Saving money for the future and enjoying life needs to have a balance. This is easier said than done. But with a conscious effort, we can balance the frugality and the YOLO lifestyle. First, we have to identify are we more prone to spending or saving. Most of us will lean more to one side. For me, I'm definitely more prone to saving money so I have to make a conscious effort to spend more on the things that are important. For a person who saves more, it is sometimes hard to spend. $50 for a meal per person seems too expensive and it is very hard for him to indulge in luxuries. To balance up, a frugal person can indulge in luxuries occasionally. It doesn't hurt to spend a bit more once in awhile especially for the people he loves. 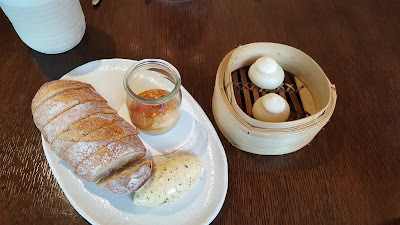 Just last year, I decided to celebrate my girlfriend's birthday in one of the fine dining restaurants in Singapore. 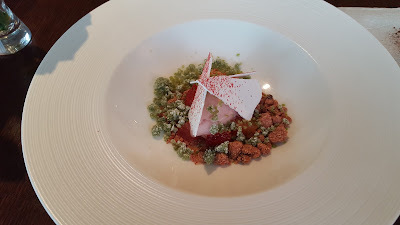 This was at a restaurant called Pollen, right inside Gardens by the Bay's flower dome. 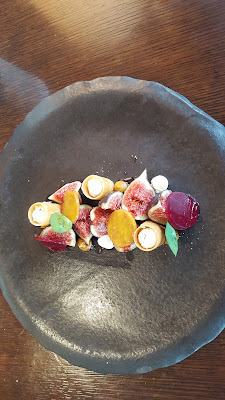 This is the first time I've ever went to a fine dining restaurant and I must say the experience is worth every single cent. 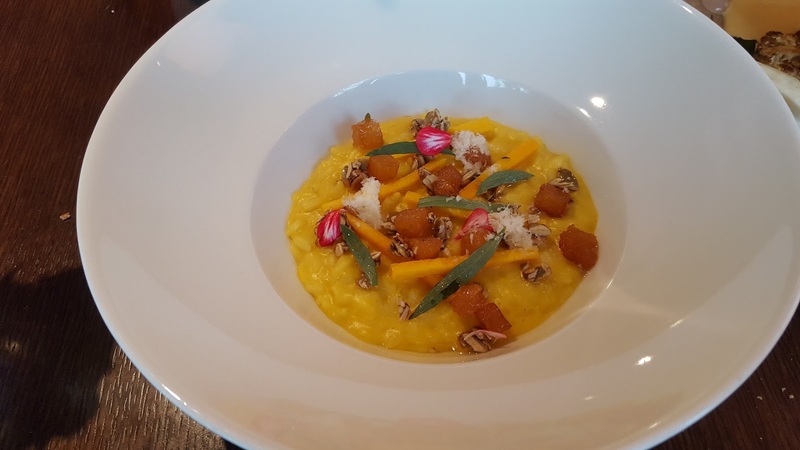 The service is good, every dish is carefully selected and prepared with unique taste in every single bite. 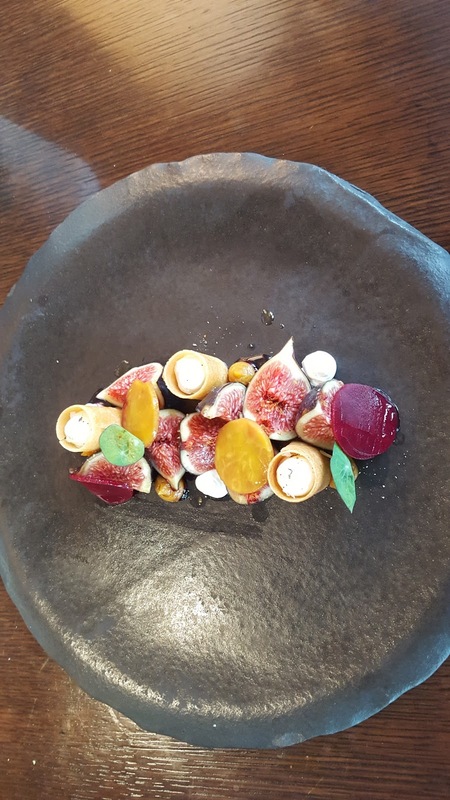 As you can see, every plate is an art work. Delicious and full of flavours. Their service is so good that they gave us a holder to put our bags, explain every dish in detailed and even provide a scarf for my girlfriend in case she's cold. They also provide buggy service before you come and after you finish your meal. The buggy sent us all the way to MBS after our meal. And I forgot to mention they actually reply to my emails very promptly. I actually arranged for a surprise birthday cake with candle to be sent in after our meals. The meal also includes an entry into the flower dome, another plus points if your girlfriend likes flowers. Just a few steps away and you're in the flower dome full of beautiful flowers. This is definitely a place to consider for a date or to celebrate special occasions with your other half. To me, now it doesn't hurt to spend a bit more just to enjoy. In the past I was probably too tight on money and am slowly changing it. I am now more focus on increasing my income than just saving money alone. How about the person who lives a completely YOLO lifestyle? To this person, luxuries are too common in his life till it becomes a norm. He has no savings and always complains of not enough money. Yes he's enjoying life fully now but when crisis strikes, he loses his job or one of his family member gets sick, he has no money for all these. The family goes through a period of tough time. As long as we have plans for the future, spending a bit more doesn't really hurt. Just $100+ on food on that special occasion doesn't hurt if you still have savings. If you borrow money to enjoy, then that is a red flag. If you use your credit cards to enjoy and cannot afford to pay the bills, then it will be disastrous. If we just use a part of our income for enjoyment while still paying ourselves first, then I think this is perfectly ok.
Frugality and YOLO lifestyle, do you think it can be balanced? Besides blogging on investments, I decided to write on some of my cafe experiences in Singapore. It really doesn't hurt to spend more just to enjoy life a little. Sometimes it can be satisfying to just spend without looking at price tag. This is my first post dedicated to food in a cafe. 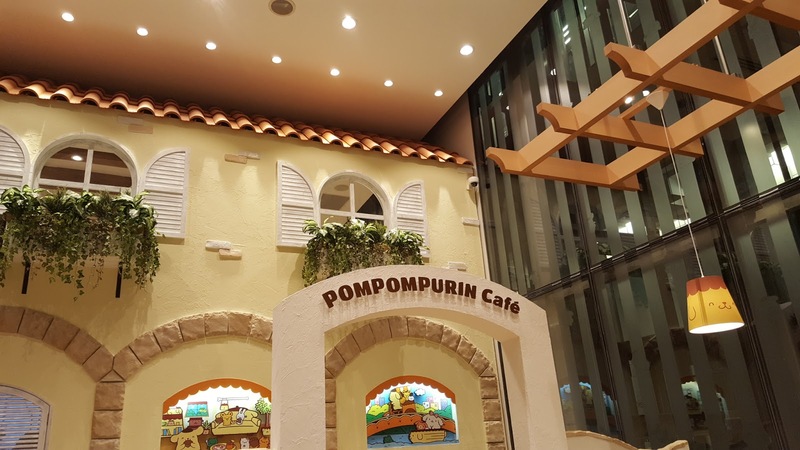 Just last week, I went with my girlfriend to this new cafe called Pompompurin. I heard a lot about the craze and didn't believe it at first. 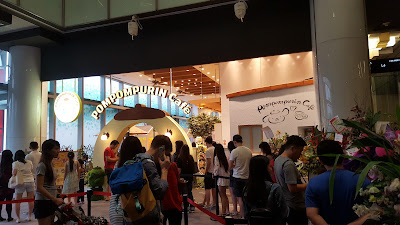 Why would people queue to experience this new cafe? We went early and reached before 5:30pm on a Saturday. The queue was already quite long with about 50 people queuing in line. Only at 7:30pm did we manage to get a seat. That's 2 hours of waiting time!! In case you're wondering what is this Pompompurin, it is actually a Sanrio character introduced in 1996. 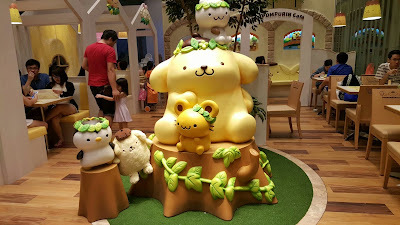 He is a big yellow/cream coloured dog (Golden Retriever) who wears his trademark brown beret. Sanrio is a Japan based company which also created the popular character, Hello Kitty. Now, this explains what the craze is about, just like the hello kitty craze Macdonalds had in Singapore. Anyway, a Hello Kitty Cafe will be also coming soon in Singapore in just a few months time. The place was nicely decorated with a garden theme. Its definitely a nice place for a date as I see many other couples too. Also, its a good place to bring your kids. They will sure love the cute designs on their food as well as the nicely decorated environment. We took a good time taking many photos and the food arrived in a short time. I guessed it was only about 10-15 mins and the food was already here. We tried the Taco rice in a cup of friendship, which includes ingredients such as minced meat, tomatoes, avocado, eggs, tacos and rice. 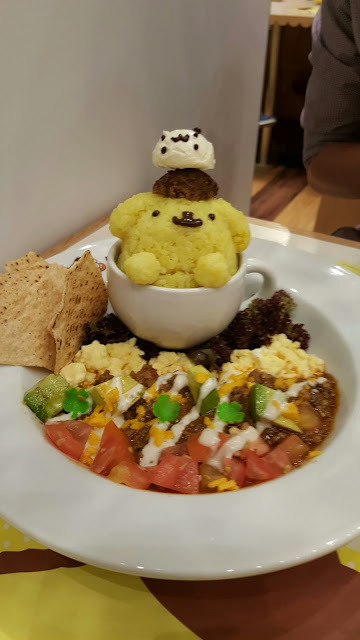 The menu actually said that the best way to eat this was to lower the Pompompurin and Muffin on the meat and veggies before mixing it all in together which was exactly what I did . I took out the whole Pompompurin figurine and it was huge inside the cup!! The rice was so sticky that the figurine manage to stay intact while I took it out. The taste was surprising quite good. The meat and eggs were well marinated with savoury sauce. However, the rice was really sticky. and we had to eat it in big chunks. 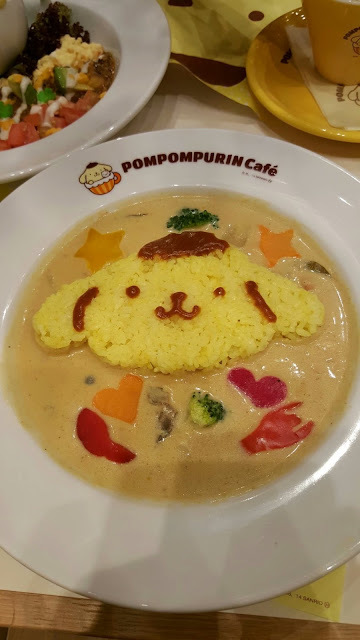 Next, we tried the Pompompurin’s Coconut Milk Chicken Curry. The curry was not really spicy with a sweet taste. It was rich in flavour and blended well with the rice. Still the best is the design of the plate. The whole face of Pompompurin was surrounded by the curry and they made the capsicum into many shapes such as stars, hearts and even fork and spoon. 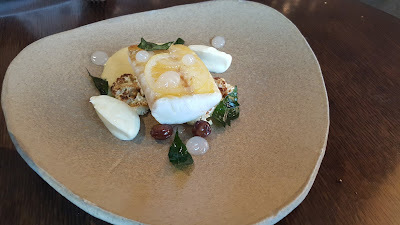 The flavour of the coconut milk was very rich in this dish so if you like coconut milk curry, this is the dish for you. Other dishes they had were the Pompompurin's Beef Stroganoff, Everybody Gather Around! Picnic Plate and 2 other spaghetti dishes. 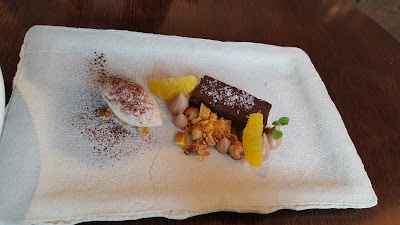 They also had many desserts and drinks to choose from. Lastly, we ordered the Love Love Hot Marshmallow Latte. It looked really nice on the menu and when it came, true enough it was Love Love and Hot. 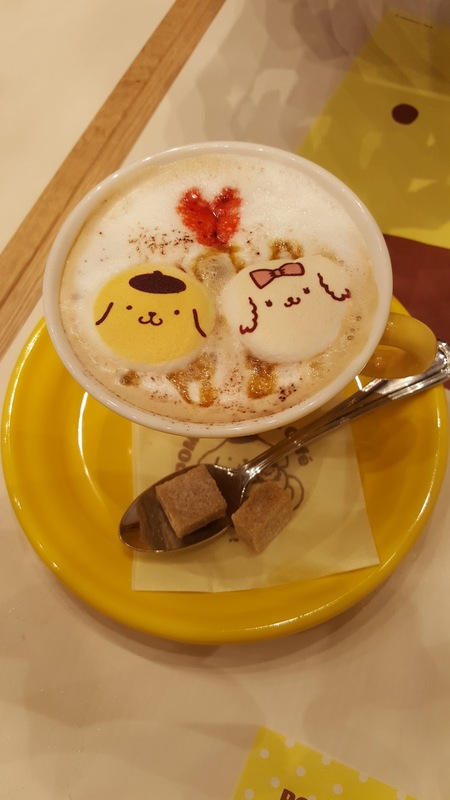 Nice designs on the latte with cute marshmallows. Overall it was a good experience. The final bill came out at exactly $60 which is not too bad for a special date. The portion is quite huge and you will sure be full after eating it. Its kinda hard to take your first bite on the lovely designs though. Bring your girlfriend, your wife or your kids there and they will sure love it! However, be warned of the queue. It takes patience to wait in line as I see quite a few people left the queue after waiting too long. Many of you may have downloaded a free Ebook on "Investing your first $20,000" which was a collaboration effort between me and a few other financial bloggers. That was a big first step in providing free content for the general public to learn more on investing and how to start it out. If you did not manage to get the free Ebook, you can down it here. Today, another free Ebook is launched for your download again. 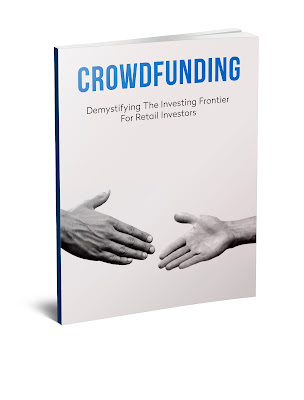 This is a book on crowdfunding and its an extensive effort that was done to put together unbiased information and views on what crowdfunding is really about. 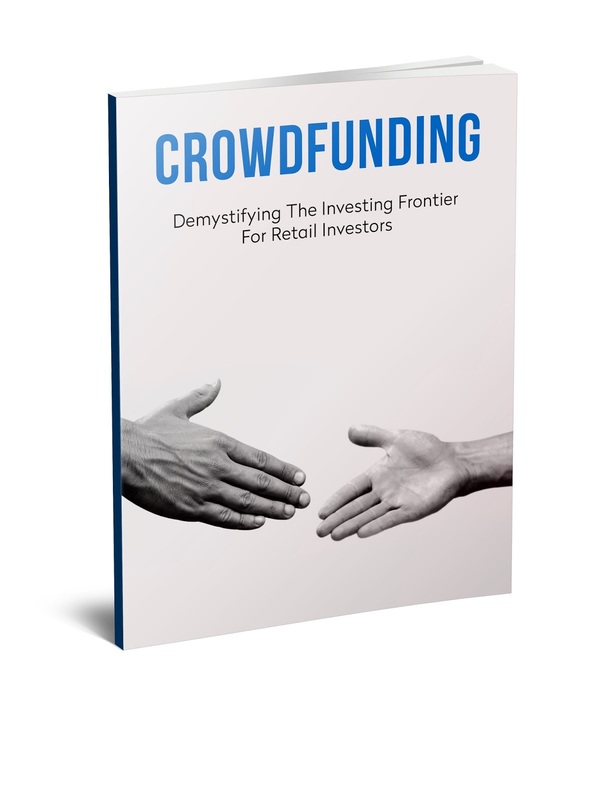 Crowdfunding is a relatively new investment frontier for retail investors in Singapore and its important to know what we are really getting into before putting our money in. There are certainly risks in it. How do we manage the risks? 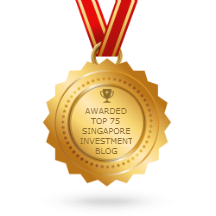 Honest and unbiased sharing from 2 experienced Singapore Crowdfunders: how they manage their risks, how they select potentially safe and successful projects, and many more bits of wisdom. I have been tracking my expenses daily for the past few years using an app called expenses manager. But... just recently, I stopped tracking once and for all. After a few years of tracking, it has more or less become a habit and it has enabled me to restrict my expenses and save up well for my future. Now the question comes... if its good, why stop tracking? There are a few reasons and I will list them all out in this article. It doesn't mean I give up managing my money from now onwards. It just means I have come to another stage where I do not need to track as rigorously as how I used to. I will also share what I will do moving forward. Yes, its good to reduce and restrict spending so we can have more for our future but having a tight budget and tracking it so rigorously every day really limits my spending. 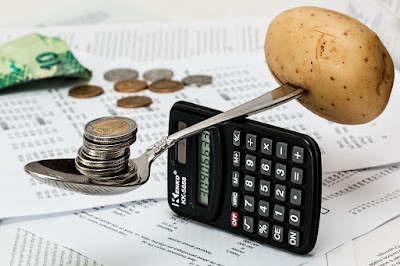 Readers would have remembered the last I posted my income and expenses update, I mentioned that I have doubled my budget which means double the expenses. However, its still too restrictively in my opinion. I have had problems when I realise I spend a little bit more this month or if I realise towards the end of the money that I have spent too much. I began to cut and restrict myself toward the end of the month. This is not the life I want to live. When I say it doesn't make sense for me anymore, I mean that even if I track my expenses daily, it does not allow me to save more. Throughout the years, I've built the habit of saving up and for me myself, I don't really spend a lot. I'm really not prone to overspending but more prone to underspending. In fact, now I want to spend more, more on the people around me and the people I love. Ever since I started dating, I knew I had to spend more so I made an effort to double my expenditure budget. In a way, it has worked well in terms of planned spending but still restrictive for unplanned spendings. When I don't spend just on myself, there are many unplanned spendings which I'm not used to. Focusing on a budget will cause a lot of problems for this. I've written a few times on why increasing income is important than just focusing on savings alone. Since last year, I made a goal to increase my income. Not just in my main job income but income from other places as well. I set up a system where it will force me to think of creative ways to increase my income and get me out of my comfort zone. This has worked well so far and moving forward, I will continue to do this which I will elaborate more below. What I will do moving forward? So now with the daily tracking of expenses gone, this is what I'm going to do. In fact, I've been doing this but will do it more aggressively now. Previously, I set up auto fund transfer to another bank account so I will not touch the money at all. This was about 75% of my salary being transferred out every month. For the past 1 year, the bank account which had 75% of my salary transferred out did not become empty. In fact, it grew healthily and continue to grow even more. How is this even possible? Does it mean I only spend 25% of my salary every month? The only explanation that the bank account can still continue to have money inside is this act of fund transfer changed my mindset to increase my income. It is impossible to survive on 25% of my salary only. According to my tracking, I spend close to 50% or more of my salary each month. Income from other sources goes to this bank account as well so any extras which I get, I can actually not worry and be able to spend it all as I already have a fixed amount transferred out for savings every month. Moving forward, I will be transferring out slightly more than 100% of my salary to the other savings account. This means I would totally not rely on my main job salary for expenses. Let's see how this goes and whether the bank account survives this later on. The transfer will start this month. Even though I don't track my expenses daily now, I will keep a track of it on a monthly basis instead. Through the transactions on my bank accounts which I can see easily using internet banking online, I can add up all the expenses and get a rough gauge of how much I spend each month. Tracking the expenses monthly will not restrict me to spend lesser towards the end of the month. I can just spend as much as I want as long the expenditure bank account does not become empty. If income manages to increase and I realise I can save more, I will transfer more out and adjust accordingly. This has been a tough decision to make to give up tracking of my expenses daily which has already become a habit for me. But, after considering all the factors, I decided this is the best way moving forward.